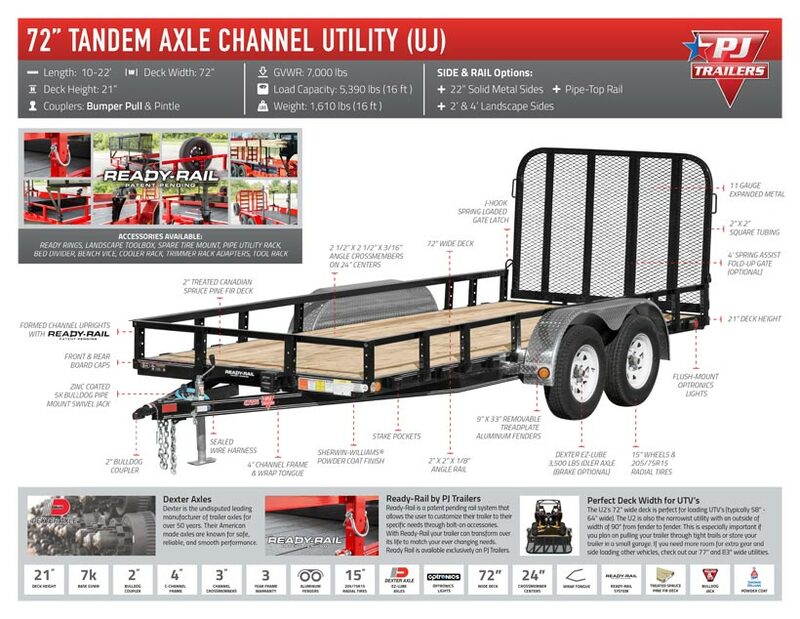 INVENTORY>>Utility Trailers>> PJ Utility Trailer, UJ 12’x72″ Tandem Axle Channel, Black Powder Coat, Tandem 3500lb Axle, Straight Deck with Fold up Rear Gate, Standard Sides, Elec Brake. 1 - Bulldog Pipe Mount Swivel Jack (5,000 lb.). 2 - Dexter E- Z lube Idler Axle (3,500 lb.). 4 Leaf Double-eye Spring Suspension. 4 - NEW 15” White Spoke Wheels. 4 - ST205/75R15 Radial Tires (1,820 lb). 9” x 33” Treadplate Removable Alum Fenders. 4” Channel Frame & Tongue. 2 1/2” x 2 1/2” x 3/16” Angle Crossmembers. 2” x 2” Removable Side Rail. 2” x 2” Top Rail. 2” Treated Canadian Spruce Pine Fir Deck. Flushmount 6” Oval Lifetime LED Tail Lights. Sand Blasted, Acid Washed, Powder Coated. 5 year Dexter Axle Warranty. *** Rear support jacks standard on 16’ or longer w/5200# axles or larger and also including ramps without support legs.